Still image from Hawaiian Paradise via Chicago Film Archives. "2 part travelogue film of Hawaii capturing the scenery, resources and people of the islands. Part 1 visits to a lava flow and other natural wonders such as Haleakala Creater and a black sand beach as well as numerous shores and valleys along the way. Stop motion animation of a toy car or ship tracks a change in location. Part 2 features footage of tropical flowers, picking coconuts, family picnic, farming and factory processing pineapple, Hula dance performances, surfing and canoeing competitions, and sunsets." 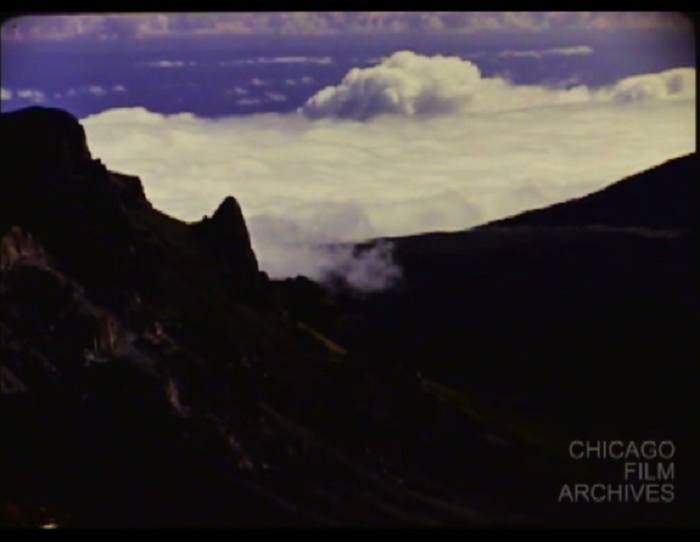 This film is a part of the Julian Gromer Collection held by Chicago Film Archives. "PART 1/2 00:00 - Titles: Produced by Julian Gromer, Hawaiian Paradise. A tree lined road seen through the car windshield. Docked Matson Line cruise ship, people boarding. TS from the ship; view of Alcatraz, the ship’s wake. Arriving in Honolulu, view from ship’s deck including a smaller passenger boat. Var. smiling women receiving leis on deck, young couples together, CU of children. HA of boys swimming and diving for things thrown into the water. 06:27 - On the street, people approach and give leis to a woman and the cameraman. ELS PAN of coast. Views of the town, var. streets and buildings. Sign depicting the distance to other major cities. CU of two boy, with an ECU on teeth and eyes. 09:47 - Landscape with mountains in distance and var. residences. Var. trees, some with fruit or flowers: palm, banyan, banana. 13:40 - Makiki Church; var. MS of exterior details and LS TILT UP. LaieTemple: var. view of temple and the cultivated grounds. Boys playing football in a dirt field, slow motion of a catch and kick. Boys swimming and diving into a river. Reverse motion of diving off the shore. 18:01 - Var. landscape of Pali; waterfall, sloping mountains, habor. Coast and city street on the big island. Car driving down a road lined with sugar cane. MCU man stripping cane with his teeth. Putting bunches on a sluice. Var. CU in a factory as cane is crushed and turned to pulp and liquid. 23:35 - ELS of a green valley. Men uprooting and replanting lotus leaves in MS. Man making and eating poi at a luau, MS and CU. Var. ELS of landscape around a lava flow, with MS and CU on hardened formations. 28:15 - LS of a shoreline and MS of crashing waves. Harvesting coffee in LS with CU of picking the fruit. PAN of large crater at Hawaii National Park, MS and CU of steaming volcanic field and fissures. CU of var. flowers. Var. LS at the shores of a black sand beach, MCU of waves crashing. Men net fishing from the shore in LS and MS. 33:44 - Fish in a small yellowish tank, groups and individual fish. CU on a hand holding coral over a blue backdrop. ELS at cloud level at Haleakala Crater in Maui, clouds rolling among mountain tops. CU of flowers growing out of the rocks. Fast motion as sun sets. Var. LS of green valley landscape in Iao Valley. 38:40 - Harvesting rows of pineapples in a field in Oahu. Water tower painted as a pineapple, MCU of a female Dole representative smiling. Nightlife in Waikiki; CU of var. neon signs and cars. Scenes at the coast; waves in Waimalano crashing along a rocky coast in var. MS, a calmer shoreline with mountains in background. ELS of deep blue ocean with rocky outcropping, lighthouse, CU of many var. flowers. 45:22-50:09 - Women selling long strands of leis on the sidewalk in MS. Departing Hawaii; docked ship, LS people boarding, saying goodbye with more leis, passengers at the railing with streamers, LS of cruise ship leaving shore and on the ocean. MS of a lei floating in the water and sunset from the deck. PART 2/2 00:00 - LS SA ocean waves rolling in on rocky mountain shore, MS waves breaking over rocks, LS volcano, town, tropical flowers in foreground, MS, CU, ECU tropical flowers 01:50 - man climbing palm tree to pick coconuts, MS dog biting husk off coconut, brings stone nut to man, play catch 03:06 - MS family eating sushi on picnic blanket, CU food and people, CU young Hawaiian man, woman 04:27 - VS slow motion, backyard football game 04:57 - CU farmer picking pineapple, MS farmer cutting tops off with machete, CU hands moving pineapples on factory assembly line, VS pineapple being processed in factory, workers sampling pineapple slices and juice 08:13 - MLS Hawaiian Hula dancers with band performing w/ ocean and palm trees in background, CU LA waist up, Hula dancer demonstrating dance, MS woman, then young girl performing a dance, MS two women and little girl synchronized dance, VS group dance 11:41 - RA men taking Hawaiian canoe into ocean, three boats racing around course among swimmers and surfers 13:01 - MS man drinking pineapple juice from tap, LS beach, HA people on beach, RA man fires gun to start surfing race, surfers paddle out, LS surfers waiting for waves, RA onlookers on beach 15:02-16:07 - MS dusk, people on beach, LS sunset over ocean with palm trees, THE END." Via Chicago Film Archives.